PAJU, South Korea, Sept. 5 (Yonhap) — South Korean football ace Son Heung-min said Wednesday he is satisfied with Paulo Bento’s training program for the national football team. After returning home with an Asian Games gold medal, Son joined Bento’s senior squad for upcoming friendly matches with Costa Rica and Chile. The Tottenham Hotspur had his first training under Bento, who was appointed head coach for the men’s national football team last month, on Tuesday. Son said he feels tired from the tight Asian Games schedule, but he is ready to sacrifice for the team, like he always has been. Bento will make his South Korea coaching debut on Friday when the Taeguk Warriors take on Costa Rica at Goyang Stadium in Goyang, north of Seoul. 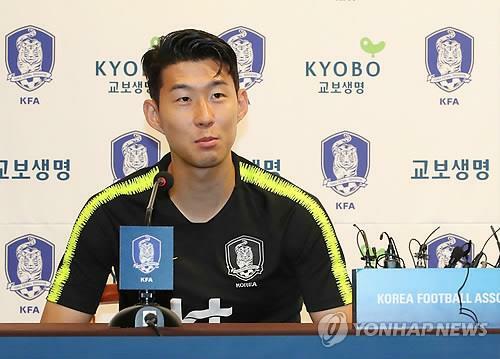 Son said he will not disappoint in South Korea’s first match with the new boss. With Bento, South Korea will first have to prepare for the 2019 Asian Football Confederation (AFC) Asian Cup in the United Arab Emirates. Son said the players are ready for the tournament. Son was captain of the under-23 team that won the Asian Games in Indonesia. The 26-year-old, who competed at the Asian Games as one of three wild card members, said he learned a lot about leadership through his Asiad experience. Son said he and Bento talked about wearing the captain’s armband for the senior side as well, but nothing has been confirmed.